Work on a fan-made redo of Vampire: The Masquerade—Bloodlines called Project Vaulderie has come to an abrupt halt after its developers received a cease-and-desist letter from CCP Games. 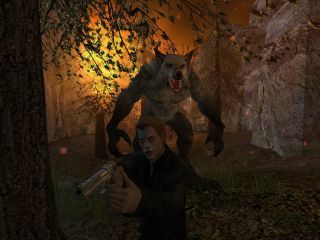 The team had actually been preparing a pitch for the project for Activision prior to receiving the letter, which clarified that while Activision "retains certain rights to the game it created," CCP owns all other rights associated with Vampire: The Masquerade. "We’re very sad to report that we received a Cease & Desist e-mail from CCP Games, asking us to cease game development, remove any materials that might contain Vampire: The Masquerade—Bloodlines, names, locations or related elements from the sites we control, and cease any further use of Vampire: The Masquerade—Bloodlines property," the leader of the Vaulderie team wrote in a farewell message. "All of this invalidates our effort and the meaning of the entire project: As a remake of Vampire: The Masquerade—Bloodlines cannot be a remake without its original contents." The message notes that Bloodlines, which was originally released in 2004, continues to be supported and updated by fan-made patches. "We made it quite clear that this is a fan re-imagining of the game. We simply want to do this to keep the game, the story, and the world it lives in, alive and re-imagined for a new generation," the message states. "Both the game and the idea behind the project was made sorely with out of passion." Nonetheless, even though CCP pulled the plug on its planned World of Darkness MMO earlier this year, it's clearly determined to protect its interests in the IP: The cease-and-desist letter threatens further legal action, "including but not limited to a DMCA notice to your Internet Service Provider," if the developers fail to comply with its demands. For those of you who missed out on the gothic wonders of Bloodlines ten years ago, it can still be had on Steam.